Camp Kipwe is situated in the Twyfelfontein area of Namibia, an area renowend for unusal rock formations and fascinating geology. The camp has been built huddled between dark red, rounded boulders and is almost invisible as the style of the buildings blends into the surroudings. The buildings have been constructed from rock, are round in shape and have domed thatch roofs, there is something a little 'Flintstones' about them but they come with all the modern touches you would expect. The rooms are built from natural materials which include mopane wood and local red basalt stones, the result is a natural and organic feel. There are 9 standard chalets and one suite. The standard chalets are anything but standard, they are unique, quirky and a fun place to stay with a private veranda overlooking the rugged and beautiful scenery. The en-suite facilites enjoy an outdoor shower with similar views to the veranda. The lounge in the main lodge has a relaxing appeal with different areas of soft seating, an ideal spot to while away an hour or two chatting. Meals and drinks are served in the bar and restuarant while enjoying the stunning views of the surrounding mountains. The sunsets simply compliment the scene. There is also a curio shop and a very welcome swimming pool, perfect for a refreshing dip after a morning game drive. Activities from camp include elephant nature trips in a 4x4, exploring the surrounding area in search of the desert-adapted elephant for which the area is known. There are also visits to Twyfelfontein to see the Bushman paintings, Burnt Mountain and the Organ Pipes, a strange rock formation, a result of thousands of years of geological activity. It's also possible to enjoy guided walks around the lodge, the length of the walk may vary according to those partaking. Location: Stunning location in the Abu Huab area of Namibia, surrounded by rugged Damaraland scenery. Rooms: There are just 10 rooms at Kipwe Camp, 9 standard and 1 suite. 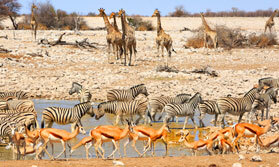 Activities: 4x4 game drives in search of the desert-adapted elephant are a popular options. Alternatively guests enjoy a trip to see the rock art at Twyfelfontein and visit Fire Mountain and the Organ Pipes on their return. Guided nature walks in the area around the lodge are possible, walks can be tailored in length to suit each group. Facilities: The main area of the lodge houses the lounge, bar and dining area. There is also a welcome swimming pool overlooking the beautiful scenery. A curio shop and reception area complete the main lodge. Dining: Meals are served in the dining room, which is open-sided. Children: All children are welcome, there are two family rooms each with a kiddies tent outside. Communication: There is no WiFi or mobile signal available here. "Enjoyed the sun downers at the top of the hill ." "Has to be the best place we stayed. Such a wonderful experience from beginning to end in every way. Accommodation, charming service, fine cuisine and a quality excursion with another quality guide. Sundowners from the top of Kipwe were stunning." "Superb! Wonderful setting, lovely people, very good food - would love to go back one day. Would be perfect for a romantic honeymoon stay. Loved the quirky bathroom fittings! Desert elephants were just amazing."